Great book. Can't put it down! St. There's said this book changed her life. It influenced her to become a nun. I found this book extremely hard to understand. I wish it had been written in layman's English. I wanted to read and enjoy it. This book is an excellent read. It is very philosophical and makes one ponder. It gives a good explanation of what might be expected at the end times. Very thought provoking making it a good meditation read! Very interesting book. Not a quick read, though provoking. Would definitely recommend. I am enjoying this book very much. I recommend this book to anyone interested in St. Therese. This book is excellent and a must read for all serious Catholics. Recommend it to all my friends and family. 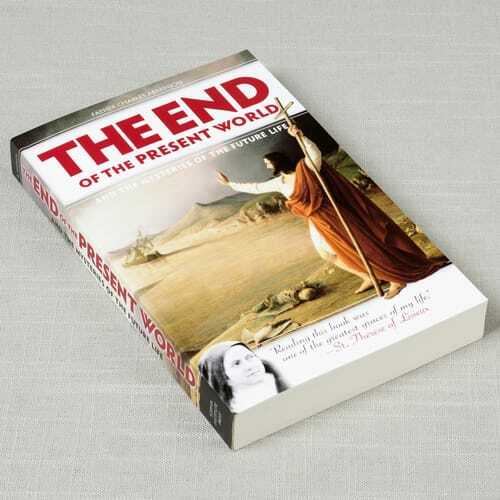 The End of the Present World is a book to be read by all even non-Catholics. I will recommend it to all my friends and family. I ordered it because I'm interested in all kinds of end times prophecies.I would use it mainly for leisurely reading. I began reading almost as soon as the package was opened! I'm still reading and will probably re-read, I bought another copy to mail to my friend so we could discuss. Very interesting. Our time on earth is so fleeting. It made me realize how I need to refocus on the life hereafter and also to pray for those who have already passed. I like this book because it reinforces the idea of all blessings or punishments of eternal life. I prefer the blessings that our dear Lord has promised to those that practice faith and keep his commandments. This book that was lost and then translated from French and Latin is remarkable. I definitely can see how it inspired Saint Therese of Lisieux in her vocation. Father Charles Arminjon was given a gift from God to share with others. A blessing brought back from the past! The book that impressed the Little Flower is brought back for modern readers. A blessing to be able to read this spiritual treasure. My thanks to Catholic Company! Given the challenges our world faces today and to find them recognized in 1870 is simply amazing and causes one to marvel at the Grace of the Holy Spirit and Father's willingness to express what the Spriit was directing him to. Thank you for the opportunity to learn again the incredible Graces from our God! This is the book that transformed and inspired the life of St. Terese. So, it must be read. The thing I like most about it is that it is a Catholic perspective on the end times and the afterlife. So much has been written and said about this topic from Protestants, and they really get it wrong, as they have little or no understanding of the many Truths that are critical to interpreting such important and enigmatic work. It is very interesting to read, but it does kind of have a slow start because it's excessively wordy, and it is also a translation from French, from the 1800s. Impressive and Important though.